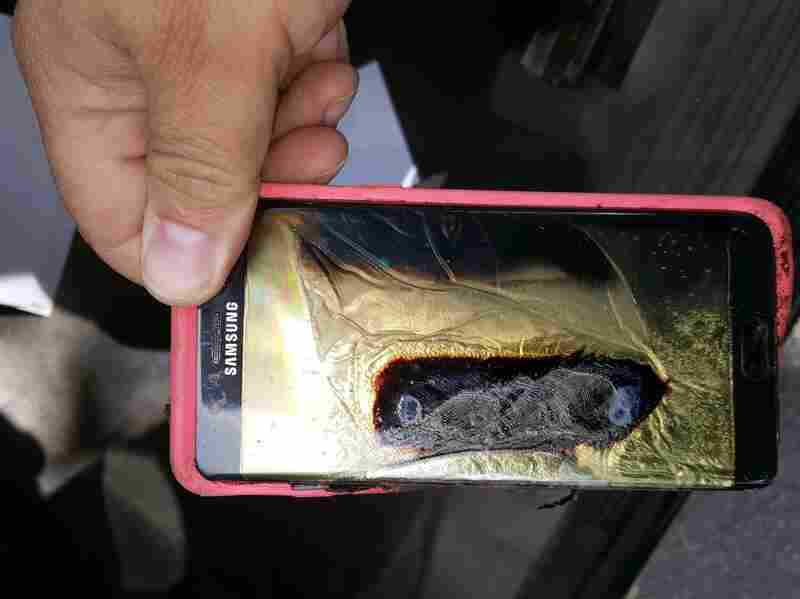 Samsung Pins Blame On Batteries For Galaxy Note 7 Fires : The Two-Way The world's biggest smartphone maker announced the findings of its investigation into its fire-prone phones that led to a record-sized recall last fall. This replacement Samsung Galaxy Note 7 phone melted on Oct 7, says a phone consumer in Minnesota. Samsung announced the results of a months-long investigation into why its Galaxy Note 7 phones spontaneously caught fire last summer, pinning the blame on faulty batteries. The bungled launch led to a recall of 2.5 million devices and losses totaling more than $2 billion. The root cause, according to an internal investigation conducted with the help of outside experts, was battery short circuits. Both companies that supplied batteries for the Galaxy Note 7 had separate issues leading to the fires, Samsung says, in part due to the rush to replace the originally exploding phones with new ones. The company did not name its battery suppliers. "The comprehensive responsibility lies with us. We did not thoroughly vet the parts that were assembled for us," said DJ Koh, the head of Samsung's sprawling mobile unit. In a packed press conference at its offices in southern Seoul Monday, the world's biggest smartphone maker again apologized to customers around the world for the bungling of its product release. Phones were initially recalled and replaced, but the replacement devices also began to catch fire. Presentations at the announcement by outside investigators backed up Samsung's findings, which indicate batteries from supplier A were shorting because of a design flaw or in some cases a lack of insulation tape. And batteries from supplier B — which were issued in the replacement phones following the initial recall — were catching fire because of a separate manufacturing defect. "We wanted to proceed quickly to change the batteries swiftly, out of concern for the consumers," Koh said, explaining why the company rushed to replace the faulty phones. "We are very sorry to the consumers for not having vetted the B batteries thoroughly. At the time the B batteries didn't exhibit the problems that A batteries did, but in retrospect the B batteries had a different issue." U.S. safety authorities are conducting their own investigation into this matter. Customers and investors will be closely watching how the company adjusts to prevent another fiasco of this size. Samsung announced a new "eight-point" product safety protocol that it says will ensure quality of its products going forward. It is set to release the Galaxy S8 device, the closest competitor to the Apple iPhone, in the coming months. The Note line may be forever discontinued. Meanwhile, tomorrow the South Korean giant will announce its fourth-quarter earnings, which is expected to be the company's best performance in three years, despite the loss on the Note 7 devices. The uptick is thanks to robust sales of chips and screens, analysts say.